Buninyong Shire (1864-1994), immediately south and east of Ballarat, was proclaimed on 16 February 1864, the successor to a Road District (1858). The name came from Mount Buninyong, after which Buninyong township was named. The shire had extremely rich goldfields extending down the Yarrowee River and Leigh River. Villages and townships along the river valley included Cambrian Hill, Black Lead, Napoleons, Durham Lead and Garibaldi. Buninyong was a separate goldfield about 5 km to the east, and it was the site of the first recognised gold discovery in the Ballarat region. East of Buninyong there is a region of rich volcanic soil, extending from Warrenheip to Gordon. It attracted densely settled Irish-Catholic farmers, and is notable for Catholic schools and churches. Major railway lines merge at Warrenheip, one from Geelong (1862) and the other from Melbourne (1889). The Melbourne line approximately parallels the Western Highway. In the south of the shire the Midland Highway entered it, passing through undulating pastoral country which has been a source of firewood and timber for mineworks. 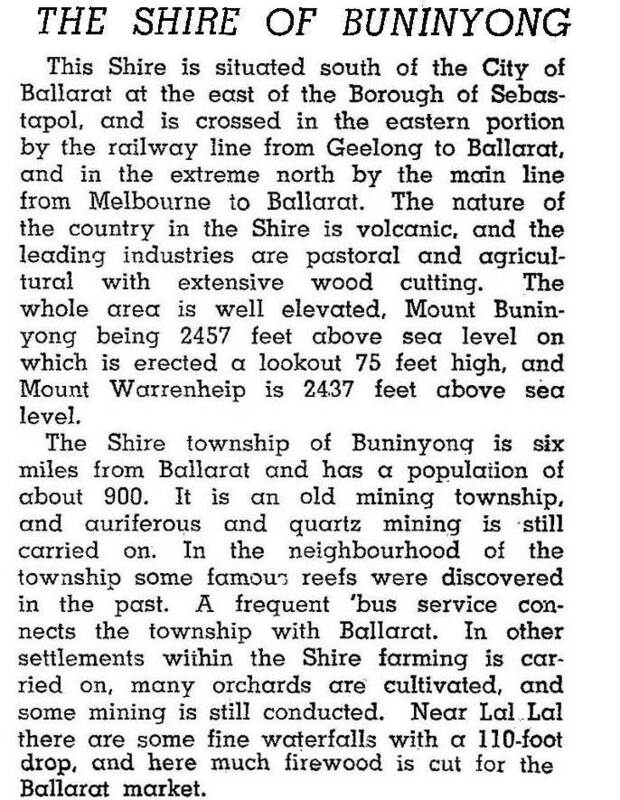 There was also a short railway line (1889-1947) from Ballarat to Buninyong. The areas close to Ballarat – Mount Clear, Mount Helen and Buninyong – attracted residential development from about the 1980s. Forty-nine percent of the shire’s 785 square kilometres was farmland in 1994, carrying 193,000 sheep and lambs and 12,300 cattle. 10,500 tonnes of potatoes were grown. In 1915 the Buninyong borough was united with the shire, and the shire offices were moved from Mount Clear to Buninyong. On 6 May 1994, Buninyong Shire underwent amalgamation, the western part with Golden Plains Shire, the eastern part with Moorabool Shire and the north-western part with Ballarat city.